This is Odie checking in from the BoggsMobile. We have been on a solid run since arriving in Ohio on Thursday. Many projects have been tackled and it is time to roll again. We are headed to London, Kentucky where revival begins tomorrow. We are looking forward to a wonderful week with Pastor Vernon Jarvis. Come join us in revival if you can. We will be at First Pentecostal Sunday-Friday. Dad worked long and hard on house projects this week! I am excited to report we are making progress toward getting things ready for the dirt work next month. God answered several prayers for us this week. Dad may have a better report for you later. 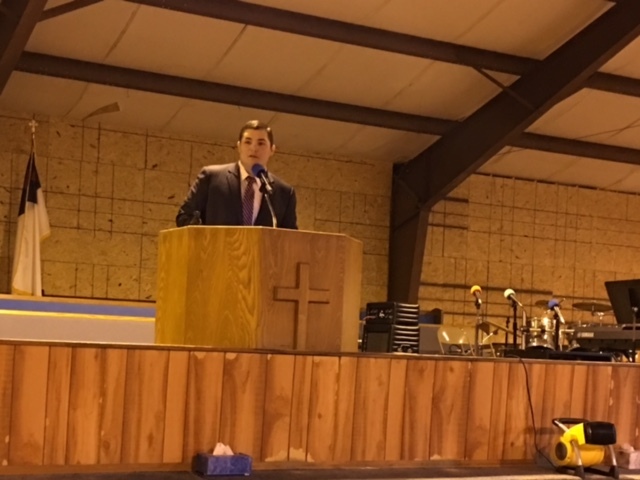 Earlier this week we were able to catch two days of the Allentown Campmeeting in Semmes, Alabama. It was great to be with Pastor Eugene Futral and all our friends at March Meeting. We enjoyed good fellowship with our brothers and sisters and received spiritual food for our souls. I was sad we could not stay for the entire meeting but I am very grateful we were able to catch half of it. I am already looking forward to being back at March Meeting at Allentown next year. Thanks for stopping by. We always appreciate you taking time to read the blog. I will close with the notes I took during the preaching this year. "You Can Come Out of the Drought"
"Revival Is Not For The Reluctant"
"The Same Yesterday Today and Forever"
"Peter Gets A Different View"
"Turning Battle Ground Into Holy Ground"